It’s like that time you played basketball in the living room. You knew you should never have done it. But it was just so tempting! And how did that work out for you? Broken lamp? Hole in the wall? And, if you grew up in a house like mine, a tanned hide to follow. You could have avoided it all: the property damage, the wounded pride, the tender backside. That’s what playing with null is like. You know you shouldn’t, but it’s just so easy! Then you get burned in the end. The problem with null is that it can crop up anywhere an object can. Consider a function that returns a string. This is always OK, right? val len = foo().length // No worries? 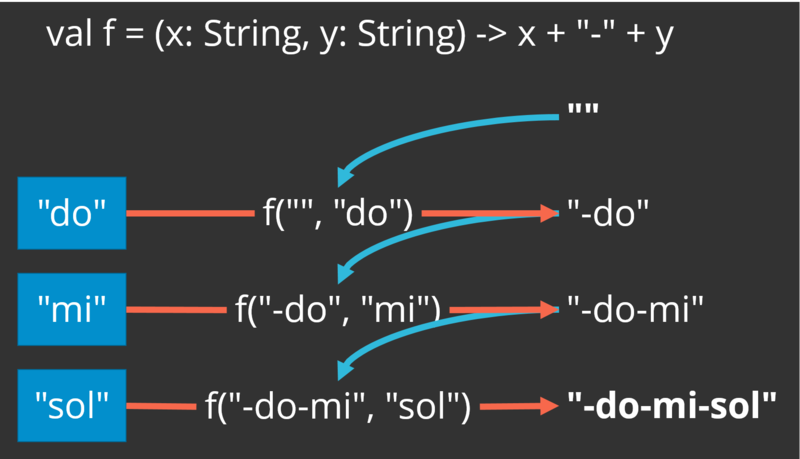 val foo: () => String = () => "foo"
Yeah, not so much. And the problem is that the compiler cannot help us: null is a perfectly legal return value. We need better semantics! A return type of String ought to guarantee me that I get a String. An empty string would be fine; it just needs to be a String! I call it my billion-dollar mistake. It was the invention of the null reference in 1965. At that time, I was designing the first comprehensive type system for references in an object oriented language (ALGOL W). My goal was to ensure that all use of references should be absolutely safe, with checking performed automatically by the compiler. But I couldn’t resist the temptation to put in a null reference, simply because it was so easy to implement. This has led to innumerable errors, vulnerabilities, and system crashes, which have probably caused a billion dollars of pain and damage in the last forty years. Fine! All this lamenting that null is a bad idea is great, but don’t you need a way to represent the idea that sometimes a function may not return a result, or at least, not what you would consider a valid result? That’s what Java maps do: If you call Map.get(key), and that map does not contain an entry for key, you get null. Of course, with most maps, null is a legal value, so you don’t know for certain whether null indicates whether the key was not found or the coder explicitly associated null with that key. 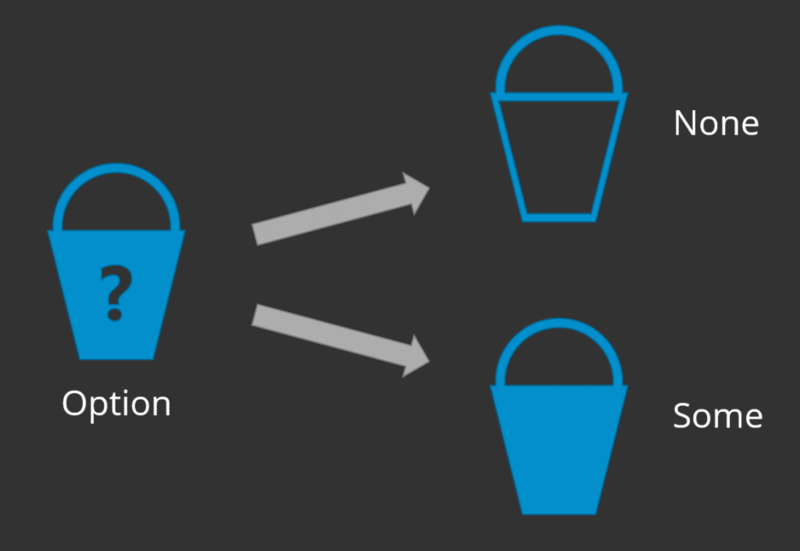 The Option Type: Is the Bucket Empty or Full? When a function returns an Option[T], it may contain a value of type T; it may not. You don’t know until you look into it. It’s Schrödinger’s cat! If the Option is empty, we call it None. If it is full, we call it Some. Next week, we will look at Option some more to see how we can use it in a more functional fashion. The filter function takes a collection and a predicate and returns only the items in a collection that meet the predicate. It discards the ones that don’t. Well, what if you want to retain all the items in the collection, but you just want them separated into two groups–the sheep from goats, as it were? That’s where partition comes in. The partition operation takes a collection and a predicate, just as filter does, but instead of tossing the items that don’t meet the predicate, partition returns a second collection along with the first: one containing all the items that meet the predicate and one containing all the rest. Now you can send that thank you note to each of the customers in the recent list and a miss-you note to each customer in the distant list. The Scala collections all define the find function. The find operation traverses a collection and returns the first item in the collection that meets the given condition(s). Notice, by the way, that scholar is not a Student, but rather an Option that contains a Student. Let’s get back to that in a minute. It warns you at compile time that you are aiming a firearm at your foot instead of letting you shoot it off at run time with one exception or another. It could be that you give a test next week that slays the entire class: you may not have an A-student that week. The Option value that find returns makes you test dunce and scholar before you use them to make sure someone is supposed to get a candy bar or a dunce cap before you start handing them out. You don’t have to program for very long before you need to sort a list of things. Scala’s collections modules are nice enough to give you a canned sorted method. Easy enough. But isn’t that interesting? ‘Y’ words come before ‘A’ words. Or rather, more correctly, ‘Y’ words come before ‘a’ words because, by default, all capital letters are sorted before lowercase letters. And that’s all that sorted does for you: It sorts using the default ordering. Wouldn’t it be great if you could alter what sort uses to sort by? Well, you can: Use sortBy. The sortBy method also works really well for classes. You can use sortBy to specify which member or combination of members to sort by. Maybe you have a class for album tracks. It has two members: track length (in minutes) and track title. Another sorting method is sortWith. It differs from sortBy in the kind of lambda that it takes to perform the sorting. Whereas sortBy accepts a function that takes a single element and generates a single value to sort by, sortWith accepts a function that takes two elements as inputs and returns true if the first element is “less than” the second element, or otherwise false. In other words, you define the pairwise comparison. Using reduce on an empty collection yields an exception. You can only reduce a collection to a value of the same type as the elements in the collection. The order of the items in the collection (usually) matters. We also noticed that there are several common operations—sum, product, and string concatenation—that are just special cases of reduce. reduce a collection of one type to a value of a different type. Why is that? First, foldLeft takes a binary operation just as reduce does, but it also takes a starting value in addition to the collection. That is how foldLeft can handle empty collections. If the collection is empty, you’re just left with the starting value. Second, because you give foldLeft a starting value, that starting value could be of any type; it doesn’t have to match the type of the items in the collection. 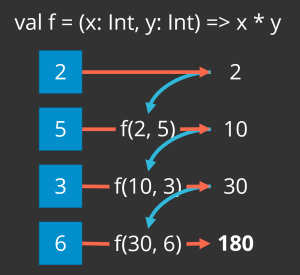 The reason reduce can only reduce a collection to a value of the same type is because the only starting value it has is the first value in the collection. Let’s put foldLeft into action. Now what if the list is empty? 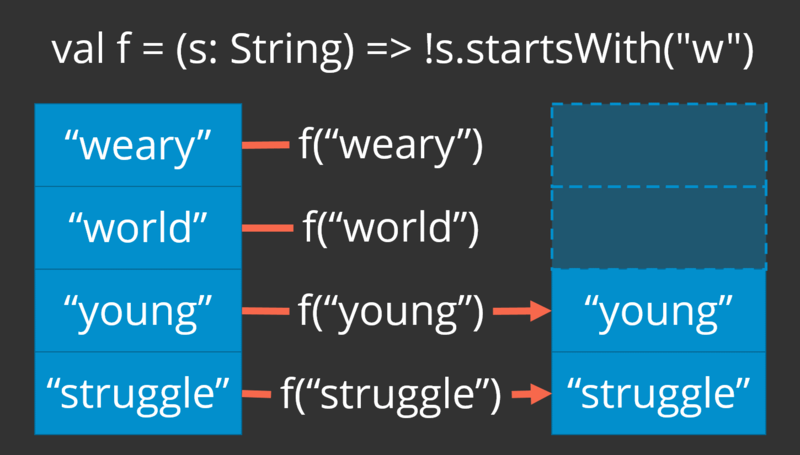 We cannot handle an empty list with reduce, but what does foldLeft do? So then, when foldLeft receives an empty collection, it just returns the starting value—in this case, 1. Last week we also implemented List.mkString with reduce. We can do the same thing with foldLeft but there are some gotchas. Eek! What happened? You don’t want the extra hyphen on the front! You just want hyphens in between the elements! What if you have a list with just one item? While reduce cannot handle an empty collection, it only starts applying the reduction operation on the first two elements. 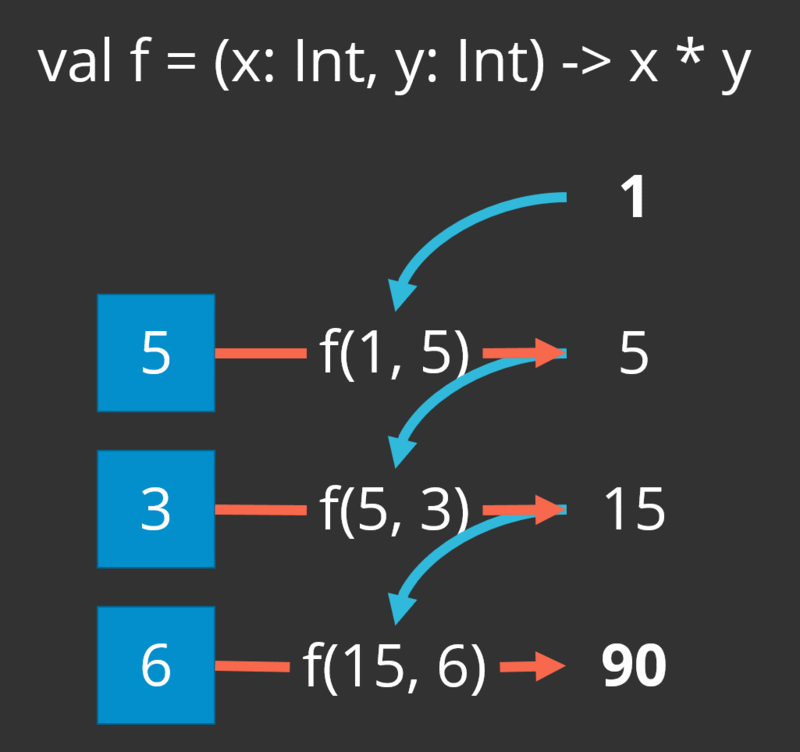 On the other hand, foldLeft applies the binary operation on the starting value and the first item in the list. // emptyJoined: String = ""
Finally, consider an example of something foldLeft can do that reduce cannot. If reduce receives a list of integers, it can only produce a single integer. 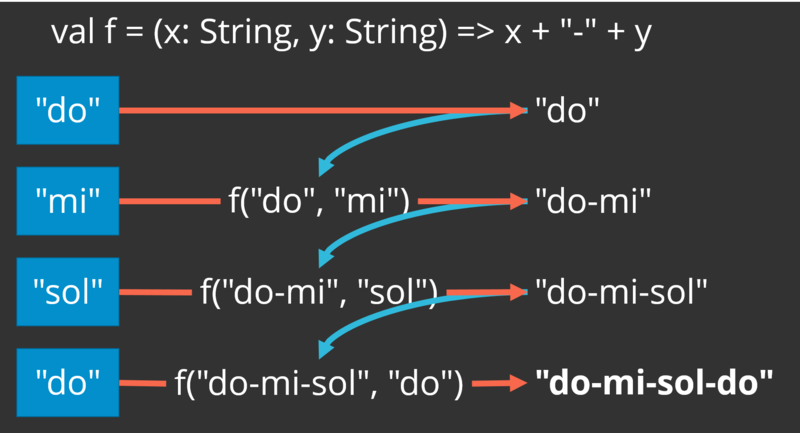 If it receives a list of strings, its result is a single string. 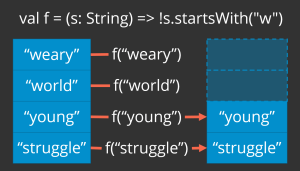 In contrast, foldLeft can take a list of integers and produce a string. Or it could take a list of strings and produce a list of integers. Notice how the starting value is a list, but the type of the elements in the input list Int, not List[Int]. 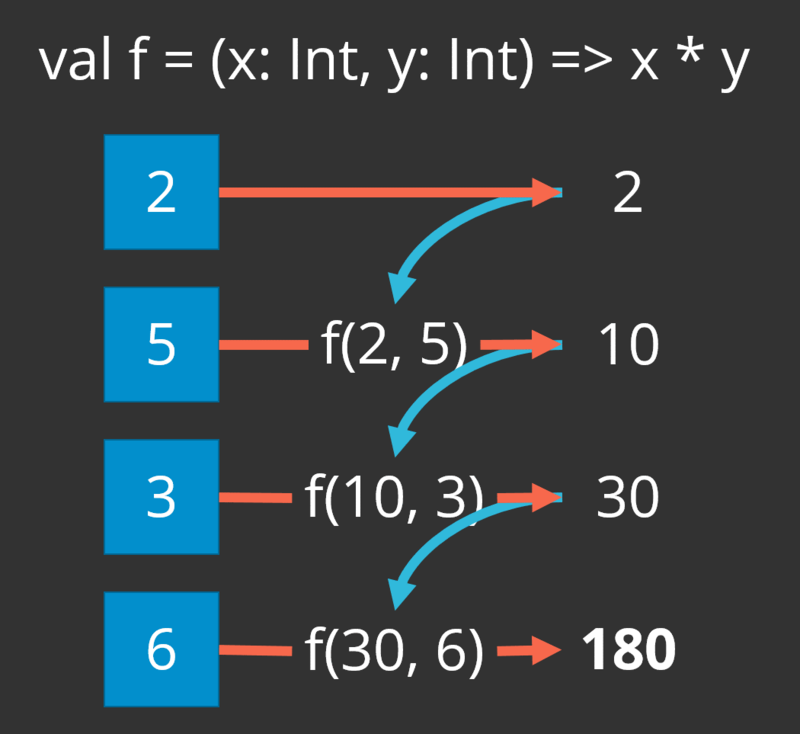 Because the starting value can be a type that is different from the type of the input list elements, the binary operation can transform the elements in the list to match the type of the starting value. In fact, that is the constraint with foldLeft: the type of the result must be type of the starting value. If your starting value is a list, foldLeft must return a list. 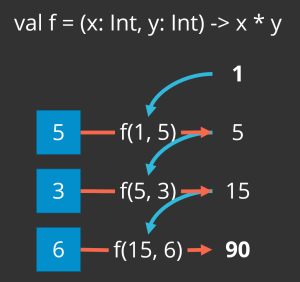 If your starting value is an integer, foldLeft must return an integer. As an exercise, you could try implementing map with foldLeft. But what if, for some reason, you want to implement sum or product yourself? Well, it turns out that sum and product are both just special cases of a more general operation that the collection modules also define: reduce. The reduce operation takes all the elements in a collection and combines them in some way to produce a single value. It uses a binary operation to combine the first two values. Then it takes the result of that first combination and combines it with the next element in the collection, and then the next, and so on through the end of the collection. The result of a reduce operation is always the same type as the elements in the collection. In other words, you can only reduce a collection of type A to a value of type A. You cannot reduce a collection of type A to a value of type B. Finally, order matters if the order of your binary operation matters. In other words, with addition and multiplication, order does not matter. That is, a + b is the same as b + a. (Mathematicians say that such a function is commutative.) But with something like subtraction, order does matter. In other words, a − b does not necessarily produce the same result as b − a. So make sure that your binary operation applies the reduction to its operands in the correct order. Having noted these caveats, next week, we will cover the fold operation. It operates almost the same way as reduce in that it walks a collection, applying a binary operation to each element. The fold operation cannot help us with that last point—order still matters—but it can handle an empty collection and, if necessary, produce a result that is of a type different from the type of the source collection’s elements. Last week we looked at Set.union. This week we look at Set.intersect. When dealing with sets (which, remember, by definition, cannot contain duplicate elements), sometimes you have two sets, and you want to know what elements they have in common. That is called the intersection of two sets. New passwords may have no more than four characters in common. // Too many characters in common! A defining property of mathematical set is that it contain no duplicates. Sometimes you need to combine two sets. But what if those sets contain some of the same elements, so that the combination would contain duplicates? No worries! That’s where Set.union comes in. The classic lineup of progressive rock band Kansas in the 1970s consisted of Steve Walsh, Kerry Livgren, Rich Williams, Robby Steinhardt, Dave Hope, and Phil Ehart. However, over the years, the lineup changed several times. Currently Kansas are Ronnie Platt, David Manion, Rich Williams, David Ragsdale, Billy Greer, and Phil Ehart. Notice how the union of the two sets does not contain duplicates even though Ehart and Williams were in both lineups. 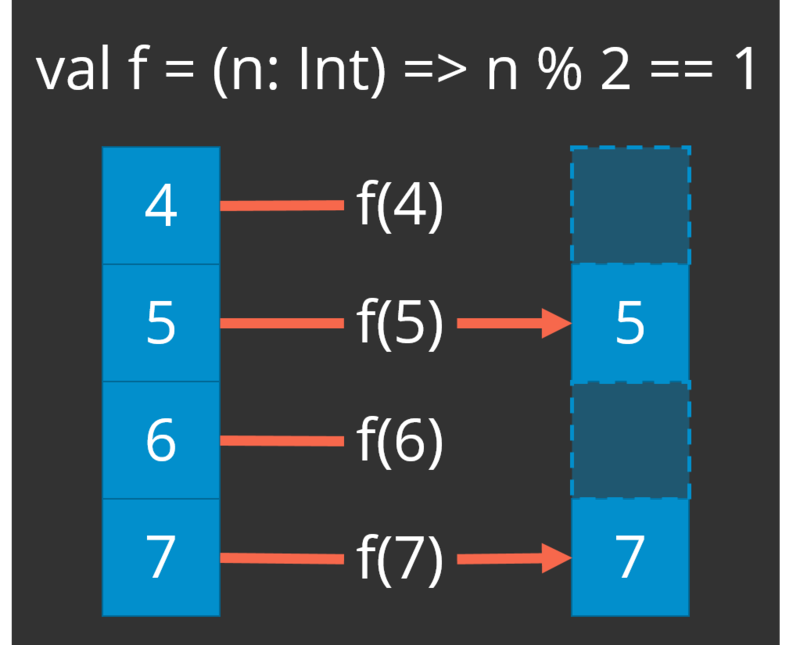 Another frequently used operation in functional programming is filter. The filter method allows you to pare down a collection by specifying a criterion. Any element in the collection that does not meet that criterion is dropped, and you get a new collection consisting only of the elements that meet the criterion. Notice that filter preserves the order of the original collection because a list is a sequential collection. The same goes for arrays and sequences. While filter works essentially the same for sets as it does for the sequential collections, it does not guarantee to preserve the order. Such is the nature of sets: they are not sequential collections. Again, while the order of the elements happens to have been preserved in this simple example with a small set, Set.filter is not required to do so. There is also Map.filter. 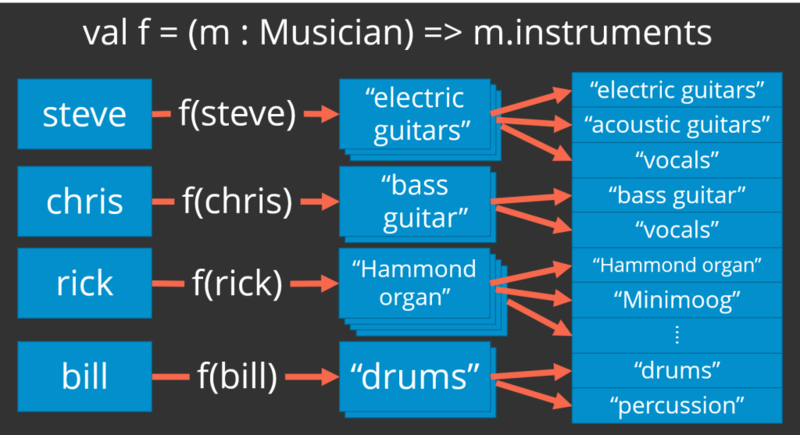 Instead of taking a single-input predicate, Map.filter takes a two-input predicate: the first input is the map’s key type, and the second is the value type. That means you can filter a map on the key, the value, or both. That’s a big chunk there, but the long and the short is that our filter function is ignoring the key (hence the underscore) and examining only the value, searching the set in each entry for Leonard’s name. The Map trait also defines a filterKeys method for filtering by key. filterKeys takes a single-input predicate like Set.filter. 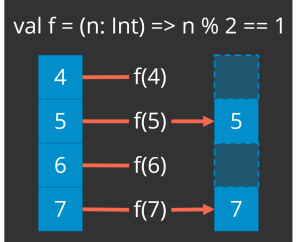 In addition to filter, Scala collections also define the filterNot method. It simply takes the filtering function and inverts it so that you get results opposite those of filter. It’s a matter of style, I suppose, as to whether you prefer to use filterNot or to use filter with a filtering function that you invert yourself. There is an argument to be made that filterNot is more readable: it is sometimes easy to overlook that little ! in a larger expression. Still, it seems like an unnecessary expansion of the API. Furthermore, if you’re going to have both filter and filterNot, why do the collections not provide, e.g., findNot, dropWhileNot, and takeWhileNot—the inverted counterparts of find, dropWhile, and takeWhile?